There is nothing more satisfying than these savory steamed dumplings filled with mung bean, ground chicken and covered with sticky rice. 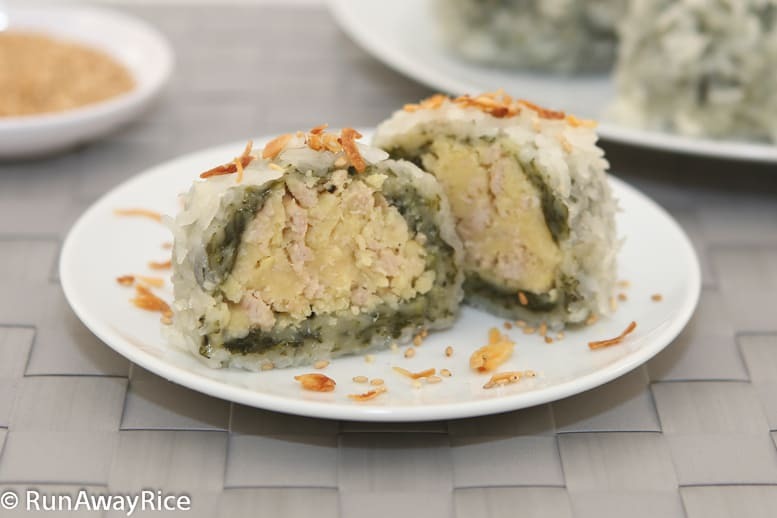 In Viet cuisine we use a lot of glutinous/sticky rice which gives foods that chewy, sticky consistency and it is a texture that I crave often. It’s pure comfort food! These dumplings are a bit time-consuming to make but they are so worth the effort. Typically when I make these, I double the recipe. Yes, this makes a lot of dumplings. But another great thing about these dumplings is they freeze nicely and so I can enjoy them whenever the cravings hit. When reheating, I just sprinkle the dumpling with a bit of water and then pop into the microwave for a few minutes. In this recipe, I share a shortcut for making the mashed mung beans using a rice cooker. The traditional way of making these beans is to steam and then put them through a potato ricer. It’s much easier and faster to cook the beans in the rice cooker. A few notes: When cooking mung beans the water tends to bubble out of the rice cooker so put a tray or thick towel underneath the rice cooker to catch any spillage. Also make sure you unplug the rice cooker right after the button pops up so the beans don’t burn and stick to the bottom. Put the mung bean and rice into individual bowls. Rinse each several times until the water is clear and soak overnight. In a large bowl, add frozen chopped spinach plus 1 cup water. Microwave spinach on high for 5 minutes. Remove from microwave and stir spinach breaking up any remaining frozen chunks. Add the remaining 1/2 cup water and stir together. Remove any large spinach stems and discard. Add both kinds of rice flours and oil. Mix until flour is all incorporated. Then knead for another 2 minutes forming a soft sticky dough. Cover with plastic wrap and allow to rest for 2 hours. Rinse the mung bean one more time and drain well. Put the beans into the rice cooker. Distribute the beans forming an even layer. Add salt and water. Cook until rice cooker button pops up, approximately 25 minutes. Unplug the rice cooker right away. Using a flat spoon, mash the beans until they are creamy and you no longer see the individual beans. Cover and allow to cook for another 10 minutes. Scoop out the mung bean and place in a bowl. In a pan over medium heat, add oil and onions and cook for 30 seconds. Add the ground chicken. Break the chicken into little pieces while cooking. Add fish sauce and black pepper. We are only partially cooking the chicken so stir-fry for no more than 3 minutes. Add the mung bean and combine with the chicken. Add water and stir. The filling should stick together at this point resembling a dough. Remove from the heat. Allow to cool slightly, approximately 5 minutes. The filling is easier to roll when it’s still warm. Use a tablespoon to scoop out the filling and roll into 20 golf-sized balls. Wet your hands if they become sticky from rolling the balls. Rinse the rice. Use a colander to drain the rice well. Sprinkle with salt and mix together. Place steamer paper into the steamer tray or coat with vegetable oil or nonstick cooking spray. Take 1/4 cup of sticky rice and spread a thin layer on the steamer paper. Scoop approximately 2 tablespoons of dough and roll it between your palms and then flatten. Place the filling ball in the middle and work the dough around the ball. Roll between your palms several times forming a ball. Roll the dumpling in the sticky rice until it’s evenly coated. Place the ball into the steamer tray. Continue until all dumplings are made. Steam the dumplings. After 15 minutes, spray the dumplings with a generous amount of water, flip them and then spray with water again. Continue steaming for another 15 minutes. I made banh khuc yesterday and they turned out so nice. Your video was a big help because I was able to adjust the amount of water added to the dough for the right consistency. My biggest problem in the past when making these dumplings was the steaming, as the rice always turned out dry and hard. But your advice to flip and spray the dumplings half way through steaming solved that problem. Thank you for another wonderful recipe. Hi, where do I buy the steamer liner? I like your video. This recipe looks healthier than most. And it’s to the point! Never made banh khuc but had it when I was younger. Will try! Glad you to hear you like the video. This is one of my favorites foods growing up. Enjoy and I would love to hear your results when you try the recipe.